Are your parents the kind that save every single plastic food container they get from any carry-out place ever? Well, while that is a good way of conserving plastic and reusing, those plastic containers are made of extremely low-quality plastic and probably are loaded with chemicals. However, if you are looking for a way to save those leftovers from your grandmother that you accepted out of pure guilt, there is an easy way. The best food storage containers are designed in a way that will provide you with secure and safe conserving of food, both in the fridge and the microwave. These will be made without BPA and any other toxic chemicals. Plus, they will probably work a whole lot better than those plastic Chinese food containers. After being disorganized for too long...Here are the Best Food Storage Containers to choose from. In the chart below, you will find our top 10 rated Best Food Storage Containers. For a more in-depth review of each model, please click on "Read Review." After being disorganized for too long....Here are the Best Food Storage Containers to choose from. What Are Food Storage Containers? Food storage containers are pretty self-explanatory. They are containers that help store any food you have, whether it be leftovers, meal prep, or other fresh food. Many are compatible with both wet and dry foods. Most households most likely have a combination of store-bought storage containers and carry-out containers that they just reuse for saving leftovers. However, what you maybe do not realize is that those low-quality storage containers are filled with toxic chemicals that are seeping into your food. Unless you are doing the research and doing your best to get yourself the best food storage containers, you will be stuck dealing with a lot of issues and concerns when it comes to your food. These regular containers are not just filled with chemicals, but they do not even do their job well in any way. If you are using a regular plastic food container, there are a few things you will probably have to worry about in the near future. Many of these regular plastic containers are not microwave safe—even though they may say so—and the Chinese take-out containers definitely are not. So if you often use them in the microwave to heat up your leftovers, which you absolutely should not do, you will have to deal with microwave degeneration. Most plastic food containers are not formulated to withstand the effects of being heated in a microwave. Due to the intense and focused heat, the plastic container can warp or even melt. And in the process, it can also release tons of chemicals into your food. Another thing that the best food storage containers do not have to deal with is BPA, or Bisphenol A. You have probably heard of this stuff before. It is a common issue when buying plastic water bottles. This is a chemical that is often found in plastics. However, many companies have started avoiding the use of it due to the studies that have shown how harmful it can be. This chemical can result in numerous health risks, and children and infants are especially susceptible to trace amounts of the chemical. In addition to BPA, there are various kinds of bacteria that plastic food containers can harbor. Due to the design of certain containers, cleaning them properly may be a bit difficult. And if they are not cleaned entirely, the small particles of food left over can turn into a breeding ground for bacteria, which then get introduced to your food. The best food storage containers are free of any and all chemicals, as well as typically being microwave safe and easy to clean. So, while buying the cheap ones in bulk may sound like the cheaper idea, you may be paying for it more in the long run. The best food storage containers can come in various different shapes and sizes within a set, and each set can be made from different materials. Of course, each has their own advantages and disadvantages, so the final choice is up to you. Hey, we can't do all the work for you. Typically, food packaging includes a wide array of materials, like plastic, metal, glass, even paper, which are processed and formed. Some containers will have subcategories, like plastic can either be rigid or flexible. Others will be microwave safe, others airtight, some can even be made for specific food types like liquid, poultry, and more. Glass food containers are probably among the best food storage containers available. Their features and lack of chemicals make them perfect for preserving and storing food to keep it fresh. These containers are also typically microwave safe and have become the standard container choice as they cannot transmit dangerous chemicals to foods. Not to mention they can be reused nearly forever. Glass is also commonly used for storing liquid, as it is transparent and allows to display the content. In addition, unless the glass is cracked, there is no chance of spillage, as they are very durable. Glass containers are perfect for refrigeration as well, as the glass is not easily affected by cold or heat. 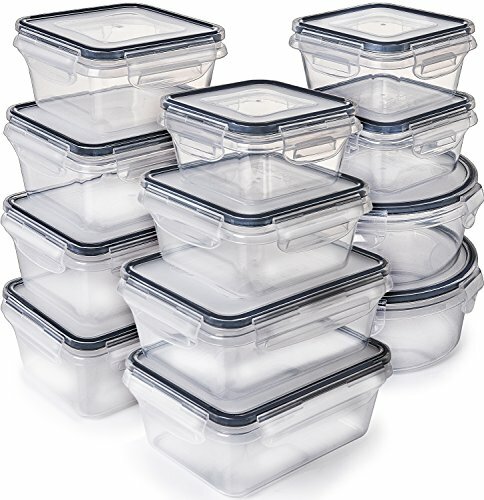 In fact, some glass food storage containers are even freezer safe for the long-term storage of your food. In terms of preserving the freshness of the food, glass containers can effectively prevent odor and moisture buildup, keeping your food as fresh as it was when you put it in. More or less. These containers are also incredibly convenient. Unlike plastic, which can crumple under too much weight, glass can be stacked and placed under far heavier objects without worry. This makes these containers perfect for long-term storage. However, glass containers tend to be a bit more expensive. But it is definitely worth it in the long run. This is a common material, specifically stainless steel, for the best food storage containers as well. These have many of the same advantages that glass has but with a few exceptions. While metal is easy to clean and does not contain any chemicals, you cannot microwave this material. For obvious reasons. Beyond that one shortcoming, various types of metal can be effective as food storage containers. Aluminum is effective at keeping odor as a minimum, as well as moisture. However, metal containers do not retain heat, which may bring the preservation level down a bit. This material is the most common. You will find plastic food containers everywhere in grocery stores. These are good for both solid and liquid storage, however you just have to be cautious about the seal quality. There are also different styles that plastic containers can come in, rigid and semi-rigid. Rigid containers retain their shape and can hold a variety of solid foods. Semi-rigid containers are typically suited for dry foods and some liquid foods. When it comes to what kind of plastic is used, there are a few different options. The three most popular types are polyethylene, polyester, and polypropylene. Polyethylene is far more flexible than the other two variations, but not a durable as polypropylene. The biggest issue that plastic has, which I mentioned before, is that you have to be sure that there are no toxic chemicals like BPA. Look for the seal on the container that says it is BPA free plastic. That is the only way to know for use if the container is free of it. In addition, it is recommended that you do not microwave any plastic container, regardless if it says it is microwave safe or not. Just don't do it. If you want to go truly eco-friendly, paper is the way to go. These, while they may not seem ideal, are designed to be leak proof and retain heat very well. The reason they are so eco-friendly is because they are biodegradable and compostable. Paper food containers are typically made from cellulose paper fiber, which makes them rather durable. However, while these are very environmentally friendly, they do not tend to be reusable. The paper is easily stained, even by dry food, and cannot be washed. Therefore, your only options are to recycle them or compost them after they are used. Since there is a lot to take in, it can be a bit confusing when you are in the store looking for the best food storage containers. But have no fear, because finding the best one is a bit easier when you know exactly what to look for. 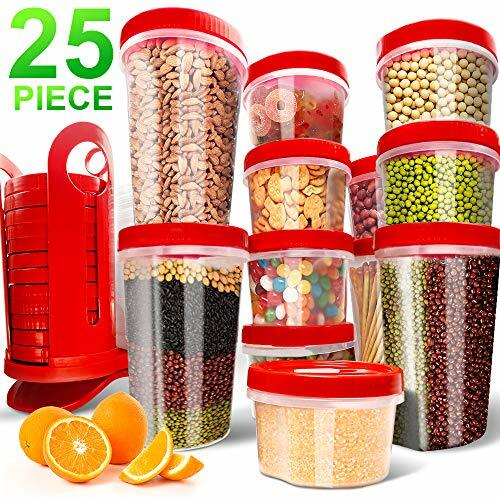 Things like which materials are ideal, what you will need the containers for, and the like are very important when picking the best food storage containers. So before you go and pick out a low-quality container that will cause you more problems than it will help, here are a few tips and tricks to help you out a bit. Every single food storage container, no matter the material, will have various labels either on the packaging or the container itself. 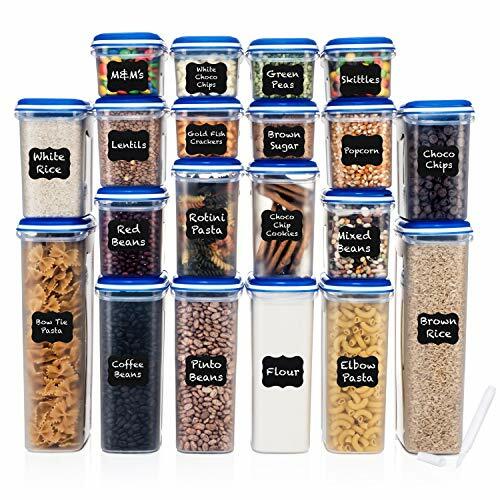 Some of the important labels that the best food storage containers will have are the BPA free label, the recycling triangle, dishwasher safe, microwave safe, and various others. The BPA free label is important as it will tell you that the product does not contain that chemical, which we went over already. The recycling triangle means more than that the product is recyclable. There is typically a number or letters inside the triangle that you need to pay attention to. If there is a 7, it means that it may contain BPA and other chemicals. If there is a "PC" then it definitely contains BPA and other chemicals. the safer plastic container options are those labeled with numbers 2, 4, and 5. Of course, you know what dishwasher and microwave safe means. But remember, don't microwave plastic...ever. The best way that your food container is going to be airtight is if it has a silicone gasket seal around each of their lids. An airtight container makes sure that your food is kept 100% fresh and preserved. Not to mention the lids prevent any liquids from leaking out of it, and that is probably the last thing you want to happen. The best food storage containers come in all different sizes and shapes, but it is best to choose containers that are about the same shape and different sizes in each container set. This will definitely help when it comes to storing and stacking them when they are in and out of use. They can easily be placed in your pantry or cabinet and take up a small amount of space. However, be sure that the containers do not include any weird shapes, curves, or small pieces. These can be much harder to clean and if not cleaned properly, can result in bacteria growth. Of course, each set of the best food storage containers have their own pros and cons. Nothing is 100 percent perfect, but some come pretty close. It is always good to know exactly what you are getting and what you may have to deal with depending on what you choose. That being said, it really comes down to what you need the containers for and how much you are willing to spend. Glass is definitely one of the best options available, especially when it comes to long-term storage. They typically come with silicone seals, which makes it an airtight container and effectively keep your food fresh while preventing leaks and outside contamination. They are also microwavable, dishwasher safe, and free of any harmful chemicals, including BPA. However, these guys can be a bit on the pricey side. They are also much heavier and bulky, which means storing them can take up a decent amount of space and finding room in a cramped fridge may pose an issue. But they are easily washable and durable as well. Metals like stainless steel and aluminum are great choices for food storage. They typically have airtight lids and seals to keep your food fresh, as well as keep odor and moisture down to a minimum. This helps preserve the overall freshness of the food. They come in many different sizes and tend to be pretty thin, which means they do not take up a whole lot of space. Not to mention the metal is pretty easy to clean and is dishwasher safe. However, they are absolutely not microwave safe, as they are made out of metal. If I need to explain that to you, you probably shouldn't be living on your own. This is the most common material used for food storage. It is cheap, easy to use, and can be easy to clean, but the lids can sometimes be an issue. They are dishwasher safe, which makes things easier as well. Some variations are microwave safe, but it is not recommended that you put them in a microwave ever. Also, plastic containers often have issues with leaking and spillage as the lids can easily pop off. Not to mention the materials that plastic food containers are made of are 100 percent not eco-friendly. You also have to worry about chemicals and BPA. These are by far the cheapest, most eco-friendly option of them all. Paper containers are biodegradable, recyclable, and even compostable. They are made to retain food temperature and prevent leaks. However, they typically cannot be reused and cannot be microwaved. When looking for the best food storage containers, there are some features that come standard. The containers that do not have these features typically you do not want to buy as they will not be worth your money. Eco-Friendly. You definitely want a food container that has a small environmental footprint. No Toxic Chemicals. The last thing you want is your container contaminating your food. Ease of care. You definitely want a container that you can wash easily because if it is hard to wash, not only will it be more of a chore, but if not washed properly, it can promote mold growth. Preservation of Food. If a container doesn't do the one job it is designed for, what's the point? The best food storage containers are out there and are fairly easy to find. Glass is definitely the best choice all around for storing food if you have the money to spend on it. But the choice is yours and it all depends on what you will usually be using them for. 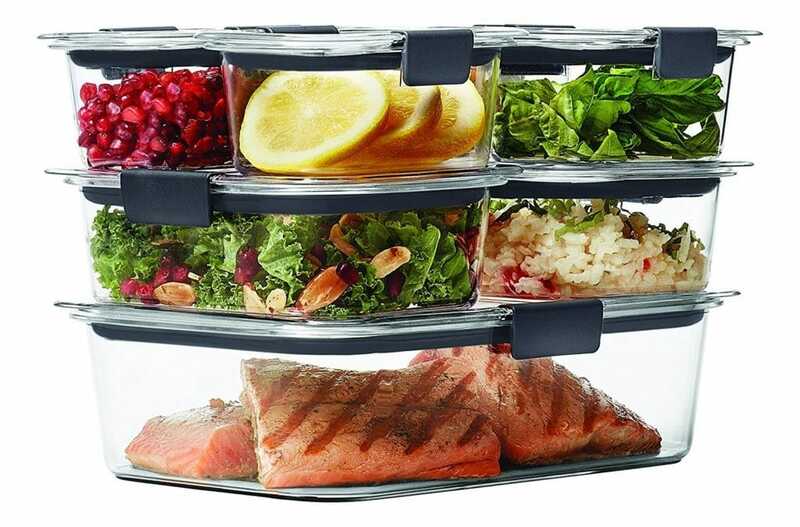 But that was our ultimate buyers guide for the best food storage containers. If you want more information on how to stay green and healthy, check out the rest of Green and Growing.